If a good sea view, bright and spacious interiors and a convenient location are on your holiday check list then look no further. Villa Nicole is splendidly located within 10 minutes' walk from Torremuelle Beach, bars and shops. What's more the resorts of Fuengirola and Benalmadena are no more than 10 minutes' drive away. The villa has a private pool, children's pool, plus a lounge and kitchen on both floors. WiFi, pool heating and air conditioning/heating in the bedrooms and ground floor lounge are included. The proximity to the beach and restaurants is just great not to mention the sea views. Top choice! The private swimming pool has an adjoining children's pool and is surrounded by sun loungers for relaxing in between taking a dip to cool off. There's a pergola to one side with the table and chairs, which along with the brick BBQ provides the vital ingredients for dining alfresco. At the side of the villa there is a lawned area with attractive flower beds adding some colour. The ground floor entrance opens into a hallway, and the first floor is accessed via an external staircase by the patio doors on the terrace. There is on street parking for your hire cars. The ground floor of the villa is light and spacious with a comfortable open plan lounge/dining room and at one end, large patio doors face out to the pool and terrace. There is a well fitted kitchen adjacent to the dining area with a breakfast table where you can enjoy your morning tea or coffee. The first floor is accessed externally by a staircase and has a second lounge with patio doors out onto a spacious, open terrace with panoramic sea and mountain views. There is another fully equipped kitchen on this level. On the ground floor there's 1 double bedroom with an en suite bathroom, and 2 twin bedrooms, both facing the front gardens which share a bathroom with twin basins and separate shower cubicle. The remaining bedrooms - a double and a twin are located on the first floor and share a separate shower room. This villa has applied for a licence with the Junta de Andalucia and the application number is CTC2018088645. The licence number will follow. This villa is located in the residential area of Torremuelle in Benalmadena Costa with the beach, a mini market and some restaurants less than 10 minutes' walk away. Torremuelle has a train station linking it to the main coastal railway from Fuengirola to Malaga, or you can reach Benalmadena and Fuengirola within 10 minutes by car. There are plenty of leisure attractions including Mijas Aquapark, tennis, paddle tennis, go-karting and fine golf courses close by. The nearest mini market is just 5 minutes' walk from Villa Nicole, with the supermarket just a few minutes' away by car. Fuengirola has one of the largest markets in the area on a Tuesday. For shopping centres, the Miramar Centre outside Fuengirola and the lovely Plaza Mayor centre on the way into Malaga city are 2 of the best. The centre of Malaga offers many well know department stores. There is a small selection of bars and restaurants in the centre of Torremuelle, less than 10 minutes' walk from the villa, with a larger selection of places to eat along the coast and into the centre of Benalmadena. Alternatively, Benalmadena Village is around 2 miles away with a great selection of cafe bars and restaurants dotted along its pedestrian centre. In the heart of Fuengirola there are bars, and restaurants all along the promenade serving local and international cuisine to suit all tastes. Torremuelle Beach is 10 minutes' walk from the villa, but strolling along the coast in either direction brings you to many beaches dotted along the coastline. 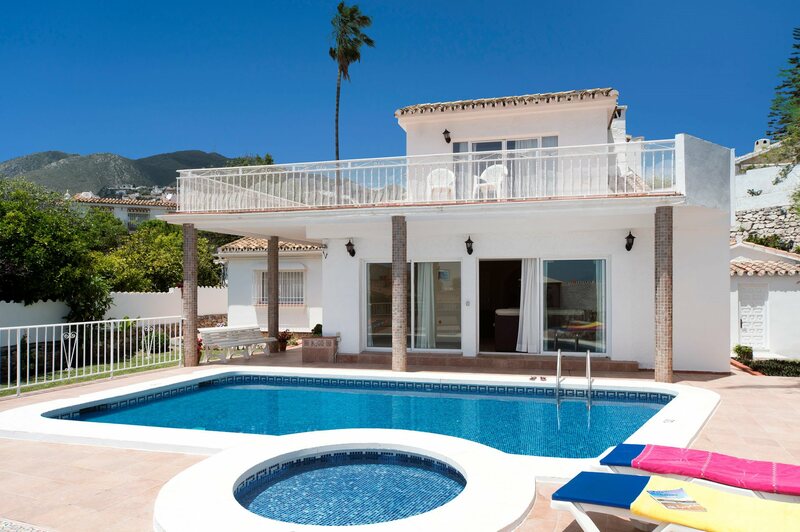 Both Benalmadena and Fuengirola beaches are within 10 minutes' drive in either direction with plenty of facilities. On the ring road around Fuengirola there is a large water park called Parque Acuatico, providing fun for all the family and within the town, the Bioparc Zoo for the younger members of the group. Further afield near the Benalmadena Costa you can spend a terrific evening out at the well-known Amusement part of Tivoli world, located in Arroyo de la Miel. In the city of Malaga you have a wonderful old town centre with traditional shops and cobbled streets to meander through whilst browsing around, in search of the Picasso or other famous museums. Or, once you are in the Costa Del Sol, many visitors choose to take a drive down to the rock of Gibraltar for a day out. The Costa del Sol is renowned for its extensive selection of golf courses, the closest being Torrequebrada, Mijas Golf Resort or Torremolinos Golf Club. However, as you drive along the coast you will find many others. From the marinas of Benalmadena, Fuengirola or La Cala de Mijas you'll find a great selection of water sports including pedalos and jet skis, with Fuengirola and Benalmadena offering a selection of boat trips too. Villa Nicole is not available to book for season as it is sold out. Take a look here at the Costa del Sol villas that are currently on sale. This attractive course, situated between the sea and the mountains has numerous lakes and strategically placed wide bunkers with no less than 6 holes directly affected by both. With large greens, winding fairways and sometimes a strong wind, it is a challenging but enjoyable course requiring skill and patience. Beware of the 7th hole, which is downhill with a left curve and a lake and two bunkers surrounding the green. The course is also suited to competitions and has hosted important tournaments and professional reunions since its inauguration in 1976. On site is a golf school, hire shop restaurant and bar. Address: Crta. De Cadiz km 220, Benalmadena Costa, 29630, Malaga Tel: 95 244 27 40 Fax: 95 256 11 29 Website: www.golftorrequebrada.com For golf bookings - Email: golf@golftorrequebrada.es Description: 18 holes, par 72, 5806 meters Green fees: 72 euros Location: East of Fuengirola on the N340 coast road on Benalmadena Costa Turn of at km 220 inland and follow signs. At Tivoli World, has been offering families a fun day out for over 40 year. You are guaranteed unlimited thrills with well over 25 exciting rides to try out and Tivolilandia for the tiny tots. There are thrilling rides such as the Tivoli Dragon, Roller Coaster, Twister, Jurassic Adventure and Tivoli Agua, the biggest flume ride on the costa. Entertainment except for the concerts is included in the price, so with theme bars and restaurants, live western and flamenco shows a visit to Tivoli World is a must. Located by the railway station in centre of Arroyo de la Miel, Benalmadena Costa. Starting from outside the Tivoli Amusement Park in Arroyo de la Miel, on Benalmadena Costa you can enjoy the thrill of a 9 minute ride in a 4 person car to the upper station on the Calamorra mountain at 724 metres above sea level. Views from the top are breathtaking along the coast and across to Gibraltar and Morocco. There are refreshment facilities and donkey rides for the youngsters and if you are wearing strong enough shoes you can climb up a little further for that extra viewpoint. For thousands of years the lost city of Atlantis has been one of the world’s great mysteries. Here at Sea Life in Benalmadena port you can join Plato to explore the fabulous Temple of Poseidon overlooking the legendary city itself. Now the home to sharks and many exotic and beautiful tropical fish you will be fascinated by the world of sea life. Boasting the biggest shark collection in Europe with over 20 species Sea Life campaigns hard for shark conservation. A thrilling and enjoyable day out for all the family. We were all pleased with the villa. Bedrooms super, bathrooms good. Lounge and dining area good. Pool, barbecue, sun beds and parasols super. We had a 60th birthday party for 17 members of our family midweek and our rep, Ana was super - we needed more shade, more glasses, she provided it. She is a great member of your team, so helpful and friendly - everyone looked forward to seeing Ana! Villa Nicole was good and very true to location to hill. Loved the holiday, will book next year. Villa was immaculately clean and tidy. Pool area was very well cleaned prior to arrival. Villa was well stocked with pots and pans etc. Bathrooms were very clean and tidy. Lots of amenities at Villa Nicole kept the kids busy and interested the whole time. Excellent value for money. Thank you. Good location, good size - great to have the separate apartment and pool was great.